Garland Ellsworth “BUCK” Wallace, passed away Aug. 8, 2012 in Mesa, AZ. He was born Feb. 8, 1913, in Liberty, MO to Carrie June Allen and Byron Procter Wallace. Buck moved to Arizona as a young man. He was preceded in death by his wife of 65 yrs, Juanita L. Morehead Wallace. He is survived by his children, Archie Lobb (Carolyn, deceased) and Wanda Thompson (Charles), grandchildren, David Lobb, Sheryl (Curt) Stradling, Richard (Kristi) Carpenter, Russell (Kristyn) Shumway, Steve (Shannon) Thompson; great-grandchildren Austin, Jenna (Josh) Wood, Trey, Chad, Seth, Race, Zane, Preston, Parker, Porter, Charlize, Adelaide Rose, and great-great-grandson Freddie Wood. He is also survived by his dear friend, Barbara Lamburtes. Mr. Wallace served in the Navy during WWII. His varied career included construction, AZ Highway Patrolman, and 20 years as a State Ranger with the AZ Game and Fish Department. Buck loved working in the beautiful mountains and lakes of AZ with his horse, Pard. 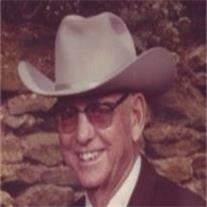 A 60 yr member of the Masonic Temple, he was a well-liked and generous man, recognized by his western hat, cowboy shirt w/pearl snaps, wranglers, leather belt ‘BUCK’, and cowboy boots. Buck always had a smile and a story. He is cherished by his family, friends and will be greatly missed. In lieu of flowers, please send any memorial gifts to Sunshine Acres Children’s Home, 3405 N. Higley Rd., Mesa, AZ 85215. Funeral services are Tuesday, August 14, 2012 at 11 AM, preceded by a visitation at 10 AM at Bunker’s Garden Chapel, 33 N. Centennial Way, Mesa, AZ.